The trick with Design Proofer is that all of the spreads need to be the exact same size and you need to have a front cover and a back cover that are exactly half the width of the spreads. That way, Proofer has all the files that it needs to display the flip book so it looks like a real book. If you are exporting from V6 Album Builder, your export will automatically include two properly sized blank cover pages (for front and back). Add a cover to your album to create a flip book. 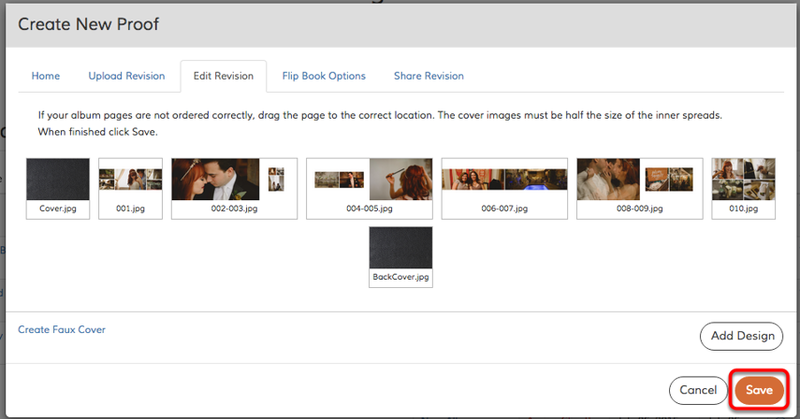 Simply select "Create Faux Cover" from the Edit Revision tab. **The flip book feature requires a front and back cover for your other spreads to stay in the correct dimension. This is not recommended for Fundy Designer export, as a properly sized front and back cover will be automatically generated when you export for Proofer. Double check that your spreads and covers are in the correct order and there are no more designs to be added, click "Save".